Martin Cruz Smith opens his latest thriller The Girl from Venice on a moonless night as an Italian fisherman named Cenzo is standing barefoot in the mud, plucking cuttlefish out of the water and tossing them into his boat. It is the final weeks of World War II, and there are Nazi gunboats prowling the lagoon, American warplanes flying overhead, and on land diehard Fascists are playing cat-and-mouse with Partisans bent on settling old scores. Cenzo is about to call it a night, take his catch to market, and head for his home on Pellestrina, the long, narrow island south of the Lido that is the heart of Venice’s fishing community. Suddenly the body of a girl pops out of the water. She is floating face up, barefoot, and clad only in a nightgown. Seaweed dangles from her long hair. Cenzo assumes she is dead. As it shortly becomes apparent, however, she is very much alive and on the run from one of those German gunboats Cenzo has been trying to avoid. And no sooner does Cenzo haul her on board his boat, the Fatima, than he hears the motor of one advancing toward him, its searchlight dancing across the water, its deck bristling with machine guns. Complications begin to pile up quickly. The girl, whose name is Giulia Silber, has escaped from the island of San Clemente, the old lunatic asylum where Venice’s Jews were interned under Mussolini until the last remaining German soldiers began rounding them up. The action then picks up speed. The girl hides in the water as the German soldiers search Cenzo’s boat, then when the Fatima sails near San Clemente she goes overboard again, this time to search for her parents in the old hospital. Against his better judgment, Cenzo follows her and ends up killing a zealous Nazi lieutenant and tossing his body down a well. It is only after Cenzo has the girl safely ensconced in his fishing shack that their backstories come out. Innocenzo, as he was christened, was a pilot who was cashiered when he refused to bomb natives in Abyssinia, and he now dabbles in painting when he’s not fishing. He had a younger brother (Hugo) who was killed in an Allied air strike and has an older brother (Giorgio) who is a movie star in Fascist propaganda films and who ran off with Cenzo’s wife. Giulia is the privileged daughter of a wealthy Venetian family who owned their own cabana on the Lido—only a quick boat ride away but a world apart from Pellestrina—and sent her to private schools, where she learned English, French, and art appreciation and can quote Byron from memory. The novel has more twists than the Venetian canals. Giulia disappears for a few chapters as the action moves from La Serenissima to Salo, the resort on Lago di Garda where the Nazis set up the Fascist puppet regime and which was the last bastion of Mussolini’s vainglorious dreams of a new Roman Empire. There are double and triple-crosses and some surprises along the way. There is a brief history lesson for anyone interested in the last days of Fascist Italy during World War II. 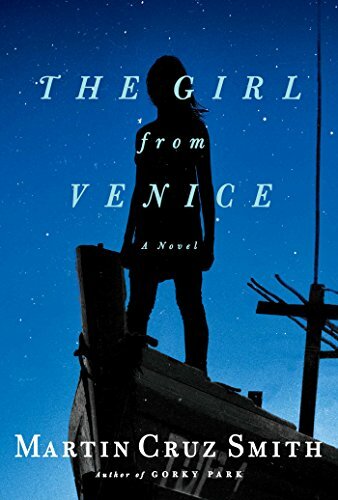 In the end, The Girl From Venice is as much a saga of a family torn by conflicted loyalties and betrayals during wartime as it is about the fisherman and rich girl. The book is not without problems, not the least of which is a highly improbable if not incredible plot and some time lines that are at best perplexing. And there is occasional carelessness in some of the writing. For example, as soon as Cenzo gets Giulia to his shack, he gives her a shirt and some trousers to change into from her soaked nightgown. Then a few pages later, she changes once again. And while the book begins on a moonless night, it is three-quarters full a day later. But a bigger problem is a flagging energy level that never really creates the life-or-death tension the author seems to be striving for, despite all the dashing about and dangerous encounters that come along. Smith is the author of more than two dozen books under half a dozen different pseudonyms, including the eight Arkady Renko novels, starting with the classic Gorky Park, which introduced the Russian detective. But Smith’s many fans likely will not quibble over small inconsistencies or hold a languid plot that stretches the limits of coincidence to rigid standards of credibility, but will no doubt be glad that a new adventure from a veteran writer of thrillers has landed on the bookshelves.